January 28, 2017 is the start of the Chinese Year of the Red Rooster. This year is the Yin Rooster which is less active than last year’s Yang Monkey. This will be a powerful year, and time to move forward, work hard, start new projects and adventures and be patient in order to achieve your goals. The year of the Fire Rooster is going to bring fresh challenges requiring quick wit and practical solutions! This year is a much calmer year overall and is less tense, strained and anxious than the previous year. This year will be a slightly warmer year in most places which are used to cooler temperatures. The nature of the Rooster is to wake up and crow at sunrise, so the Rooster is trying to wake people up and challenge them all year. This year people are more cheerful and find simple pleasure to enjoy life. We will feel more in touch with one another and want to spend more quality time with friends and family. Year of the Rooster will bring romance to Monkeys, Rats and Dragons. It will also be an excellent year for Dragons overall. This is a great year to lose weight. Fitness will be a huge focus for most people with emphasis on walking, dancing, yoga, tai chi and qi gong. In terms of health, there will be likely problems with Heart disease, inflammation and breathing issues. Colds and flu increase is expected as well as problems associated with skin, eczema, itchiness, hives and digestive issues such as irritable bowels. Last year was crazy and fast moving for most, so it is vital to support the adrenals this year and practice meditation, breathing and calming techniques to reduce stress hormones. Tiredness is a big factor this year and it could affect kidneys and bladder for many people. Therefore, it is important to sleep, rest and regenerate. Those that have a baby Rooster this year can be blessed with smart academics that will do very well in school. Lucky Colours for 2017: To bring luck to 2017 wear these auspicious colours in daily life activities to bring abundance and prosperity. As the element for this year is RED, do not use red in your clothes and accessories. Lucky colours in the Fire element include, pink, yellow, orange, gold. Complementary colours such as green and brown are also lucky. Purple and lavender colours are also lucky. Wearing amethyst and topaz can also help you bring luck to 2017. Avoid red, blues and blacks. 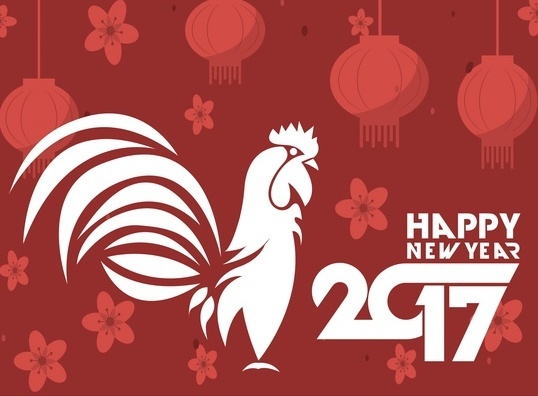 Remember to embrace new challenges and creative endeavours and have a happy, joyous and prosperous Year of the Rooster 2017!